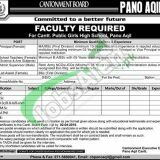 Here we provide you Cantonment Board Pano Aqil Jobs 2019 Latest Advertisement. Cantonment Board Pano Aqil is government department working for the development of Pano Aqil district which announces different job opportunities for the residents of Pano Aqil and currently it requires the following full-time staff on temporary / contract basis for Cantt. Public Girls High School, Pano Aqil such as (Principal (Female), School Teacher (Female) (Science & Arts Subjects), Admin Supervisor (Male), Lab Assistant (Female)). Interested candidates are advised to read the eligibility criteria first before applying against any vacant positions because recruitment will be held on merit basis and at the time of verification of applications those who are ineligible will be out of selection procedure. Candidates willing to apply should hold MA/MSc/BA/BSc Degree with minimum 3 to 10 years of working experience in reputed college. So, viewers take advantage from this opportunity and apply as soon as possible because once you are selected here you’ll be able to earn handsome salary package with other facilities as per the policy of Cantonment Board. Now in the following complete how to apply procedure is given below. Applications on given format along with detailed CV and relevant documents should reach the following address given below. Already serving in Government Sector should apply through proper channel. Last Date for submission of application is April 02, 2019. Late applications and those which are incomplete shall be summarily rejected. Only shortlisted candidates will be called for test/interviews for which no TA/DA will be paid. Address: Cantonment Executive Officer Pano Aqil Cantt.